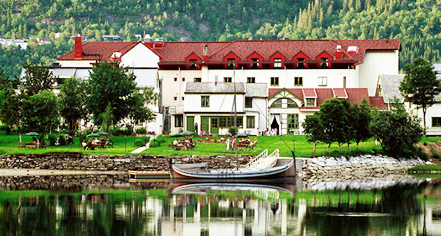 Ideally situated on the Vefsna riverside in the center of Norway within Mosjøen, Fru Haugans Hotel was established in 1794 and has been a women-run retreat since 1885 offering warm hospitality and excellent service. Strolling around the hotel is a journey through time, where the rich history of Norway is exhibited. A beautiful location at the end of the picturesque Sjøgata street, Fru Haugans Hotel has holds the distinction of being Northern Norway’s oldest preserved adjoining wooden buildings. Restored to feature traditional Norwegian fittings, all of the 93 guestrooms at Fru Haugans Hotel's have been approved by the Directorate of Cultural Heritage. The property has a focus on inviting guests to explore the historically rich property that features a guided tour and museum with a impressive collection of authentic antique items previously used at the hotel. Fru Haugans Hotel, a charter member of Historic Hotels Worldwide since 2012, dates back to 1794. 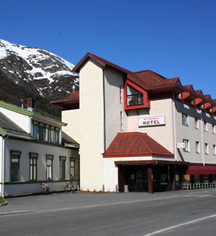 Fru Haugans Hotel is known for its long tradition and is the oldest hotel in northern Norway. Parking: Self-parking: Available. Valet parking: Available; surcharge. Ideally situated on the Vefsna riverside in the center of Norway within Mosjøen, Fru Haugans Hotel was established in 1794 and has been a women-run retreat since 1885 offering warm hospitality and excellent service. Strolling around the hotel is a journey through time, where the rich history of Norway is exhibited. Learn more about the History of Fru Haugans Hotel .